When people think of fine art, they often call to mind the names of masters of the past like Van Gogh, Monet, or da Vinci. However, the field of contemporary art is just as full of names worth knowing. The recent auction of David Hockney’s painting “Portrait of an Artist (Pool with Two Figures)” for $90.3 million smashed the previous record for an auction sale by a living artist, previously held by Jeff Koons’ sculpture “Balloon Dog (Orange),” which sold for $58.4 million in 2013. The painting highlights two of the themes Hockney’s work from the 1960s and ’70s is known for—emotionally complex double portraits and swimming pool landscapes—and its sale generated considerable buzz in the contemporary art world. Although its price was considerably less, the drama surrounding the auction of Banksy’s painting “Girl with Balloon” at Sotheby’s, in which the iconic painting was half-shredded moments after the gavel fell also generated much discussion. Fortunately for the buyer, who elected to keep the transformed work at the auction price of $1.4 million, experts believe that the work’s new provenance as a piece of conceptual art will only increase its value. Contemporary art doesn’t offer the certainty that one might find in collecting already-established masters. After all, it’s hard to know which of today’s up-and-coming artists might gain the popularity (or notoriety) of Hockney, Koons, or Banksy. However, it is not difficult to find articles and lists noting rising or influential artists currently working in the field. For example, W Magazine suggests that portraitist Nathanial Mary Quinn and painters Eliza Douglas and Christina Quarles are among up-and-coming artists to take note of. As with older art, when a contemporary artist becomes well-known, their work is often priced out of reach of all but the wealthiest collectors. Along with those of Koons and Hockney, the works of Jasper Johns, Christopher Wool, Brice Marden, Yayoi Kusama, Cindy Sherman, and Cecily Brown, among many others, have been known to command staggering prices at auction. The groundbreaking work of such artists often receives acclaim because it influences the work of others, producing thought-provoking shifts in artistic expression. However, it’s not necessary to possess a multimillion-dollar masterpiece, whether it is contemporary or classic, to enjoy having artwork. 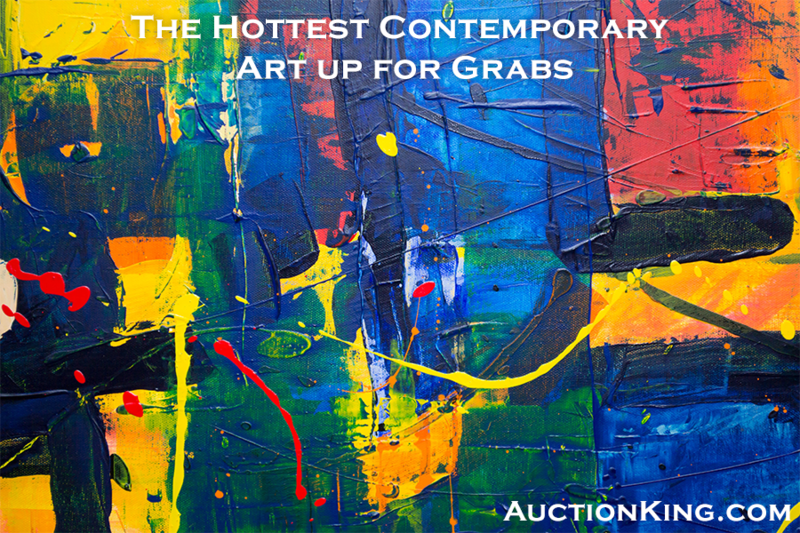 Auction King gives you the opportunity to own striking pieces in a variety of mediums and styles at a fraction of what you might pay at a gallery. As with all of the items available on our site, our artwork is triple-checked for authenticity so you can bid with confidence. Our online format makes it easy and convenient to bid wherever you are, so geography is no limit to obtaining the artwork that speaks to you. Register for a free online account and start bidding today. Previous PostPrevious Why Is Morganite so Popular?